Stoke manager Mark Hughes said fan unrest was "understandable" after a 3-0 home defeat by West Ham increased the pressure on him. The Potters have now lost five of their past six and conceded the most goals in the Premier League, and chants of "Hughes out" and "sacked in the morning" greeted the final whistle. This latest defeat, which included a penalty by Mark Noble that Hughes accused West Ham's Manuel Lanzini of diving to win, put Stoke one point and one place above the relegation zone. 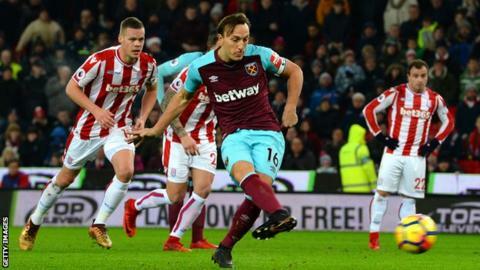 Further goals from ex-Stoke player Marko Arnautovic and Diafra Sakho added to their misery in a loss that came a week after fans at a train station vented their anger at the Potters squad following a 5-1 thrashing by Tottenham. "That's understandable," Hughes said. "Up to 75 minutes before the second goal, I thought the fans were absolutely magnificent, they were driving us on, totally behind us. "Like ourselves on the bench, as soon as the second goal went in it took the wind out of our sails, you get a little bit anxious, a little bit angry then you get a response but for the most part I thought they were great." Kick-off was delayed by an hour at the Bet365 Stadium because of a power outage, and many home fans left early as a grim-faced Hughes looked on. Lanzini tumbles as Stoke's Erik Pieters makes a challenge. Mark Hughes called it a "dive" but David Moyes said his player "went over with fatigue"
Hughes feels his side are in a downward cycle of unjust decisions against them. He criticised referee Martin Atkinson for not sending off Liverpool's Simon Mignolet when he tripped Mame Biram Diouf during the Potters' 3-0 home defeat in November. Now he is angered that Graham Scott pointed to the spot when Lanzini went to ground under minimal contact from Pieters. "It's the way our luck is going at the moment," the Potters boss said. "Things are conspiring against us and we need help from referees to get things right. "I've seen it again. The guy's dived. He's drawn the challenge. He's a clever player. It was clearly a dive and the ref's seen something that no-one else saw. All in all, it was a poor sequence of events for him and for us. "It sounds like sour grapes when you talk about people getting punished retrospectively. It doesn't help us now." Noble converted the penalty, while Austria international Arnautovic should have had a hat-trick, hitting the woodwork twice in the second half before finally finishing with his right foot into the bottom corner after a deft exchange of passes with Lanzini. Substitute Sakho compounded Stoke's woes when he collected the influential Lanzini's through ball and slotted coolly past keeper Jack Butland. They call Marko Arnautovic 'Arnie' at London Stadium, and the Austrian shares a steely determination with some of his Hollywood namesake's biggest movie roles. He was booed relentlessly by Stoke fans unable to forgive him for his £20m summer move to the capital. But the 28-year-old, who was told he must work harder or risk being dropped when David Moyes arrived in November, used the barracking as motivation. He braved the catcalls after he missed several strong chances, and hit the bar twice, and kept plugging away without letting his head drop. When he was replaced on 79 minutes former boss Hughes demanded he hurry off the pitch and a Stoke scarf was thrown at the striker from the stands. Arnautovic's response? He gave jubilant West Ham fans in the away end the Hammers' crossed-arm 'irons' symbol and headed straight down the tunnel. Xherdan Shaqiri had more touches (78), shots (six) and key passes (four) than any Stoke team-mate. Centre-back Ryan Shawcross had four efforts but no forwards other than Shaqiri had more than two. They are having a party at Stoke's stadium tonight. More than 500 partygoers will toast the festive season at a pre-booked corporate event, but the Potters fans among them will not feel much like celebrating. This latest setback against fellow strugglers puts even more pressure on next Saturday's similarly high-stake game against second-bottom West Brom and also on manager Mark Hughes. Stoke chairman Peter Coates has denied Hughes is facing the sack, but the problems are mounting for a side who are now one point and one place above the relegation zone. Luck appears to have abandoned them with big officiating decisions, such as the close call for Noble's penalty. They are also not helped by their over-reliance on playmaker Xherdan Shaqiri to provide a spark - he is just not being supported enough by other forwards. Finally, they keep conceding softly - they have now gone behind first in their last five outings. Here their best chances fell to captain Ryan Shawcross, who could not get a string of headers on target. Something must change or the mood will continue to darken in Stoke, like the lights at the stadium when the power went before kick-off. West Ham manager David Moyes told Match of the Day: "The result went our way and it was an important win. We're gaining momentum and at times we showed that. On the penalty: "The defender gave the referee a decision to make. Manuel Lanzini ran about 70 yards so I think he went over with fatigue rather than a dive. I'd be disappointed to give away a penalty like that but sometimes that's the way it goes. "We had to deal with a lot of stuff but we missed good chances. I was annoyed with Marko at half-time as he had the chance to get two. He's doing really well and I said to him at half-time he would score. "Clean sheets are one of the things you want to do. Don't shout about it too much as we're going to need a few more." Stoke manager Mark Hughes on Match of the Day: "We huffed and puffed, up to the point of the second goal we were in it. We were damaged by a poor decision - it allowed them to get people behind the ball. They're a threat on the attack and in the end that's what's taken the game from us. "When we try and be expansive we can't go one v one, we get picked off. We've got to be better in that regard." Stoke have kept just one clean sheet in their last 16 Premier League games. This is the first time since March 2014 (Manchester United) that a side managed by David Moyes has kept three consecutive clean sheets in the Premier League. Stoke City have lost five of their last six matches in the Premier League, winning the other. Manuel Lanzini provided two assists and won the penalty in this match - it is only the second time that Lanzini has assisted two goals in a single Premier League game (also against Middlesbrough in January 2017). Marko Arnautovic is the third player to score against Stoke in the Premier League having previously played for them in the competition (also Wilfried Bony and Seyi Olofinjana). This was Stoke City's 50th home defeat in the Premier League. Mark Noble made his 300th appearance for West Ham United, the first player to reach this milestone for the club in the Premier League. Of Mark Noble's 34 Premier League goals, 19 have come from the penalty spot (56%). Stoke City host West Brom next Saturday (15:00 GMT), while West Ham are at the Emirates to play Arsenal in their Caribao Cup quarter-final on Tuesday (19:45). Match ends, Stoke City 0, West Ham United 3. Second Half ends, Stoke City 0, West Ham United 3. Foul by Chicharito (West Ham United). Xherdan Shaqiri (Stoke City) wins a free kick in the defensive half. Corner, West Ham United. Conceded by Ramadan Sobhi. Corner, West Ham United. Conceded by Josh Tymon. Corner, West Ham United. Conceded by Jack Butland. Attempt saved. Chicharito (West Ham United) left footed shot from the centre of the box is saved in the bottom left corner. Assisted by Manuel Lanzini. Goal! Stoke City 0, West Ham United 3. Diafra Sakho (West Ham United) right footed shot from the centre of the box to the bottom right corner. Assisted by Manuel Lanzini. Attempt missed. Diafra Sakho (West Ham United) right footed shot from the right side of the six yard box misses to the left. Assisted by Chicharito. Foul by Arthur Masuaku (West Ham United). Geoff Cameron (Stoke City) wins a free kick in the defensive half. Attempt missed. Saido Berahino (Stoke City) right footed shot from outside the box is high and wide to the right. Assisted by Joe Allen. Manuel Lanzini (West Ham United) wins a free kick in the defensive half. Substitution, West Ham United. Chicharito replaces Marko Arnautovic. Offside, West Ham United. Diafra Sakho tries a through ball, but Marko Arnautovic is caught offside. Goal! Stoke City 0, West Ham United 2. Marko Arnautovic (West Ham United) right footed shot from the right side of the box to the bottom right corner. Assisted by Manuel Lanzini with a through ball. Attempt missed. Diafra Sakho (West Ham United) right footed shot from the centre of the box misses to the left. Assisted by Marko Arnautovic. Attempt missed. Ryan Shawcross (Stoke City) header from very close range is just a bit too high. Assisted by Charlie Adam with a cross. Corner, Stoke City. Conceded by Declan Rice. Attempt blocked. Charlie Adam (Stoke City) left footed shot from the left side of the box is blocked. Assisted by Ramadan Sobhi. Attempt missed. Marko Arnautovic (West Ham United) right footed shot from the right side of the box is close, but misses to the right. Manuel Lanzini (West Ham United) wins a free kick on the left wing. Foul by Pedro Obiang (West Ham United). Ramadan Sobhi (Stoke City) wins a free kick on the left wing. Substitution, West Ham United. Diafra Sakho replaces Michail Antonio. Marko Arnautovic (West Ham United) hits the bar with a left footed shot from the right side of the box. Assisted by Manuel Lanzini. Attempt blocked. Xherdan Shaqiri (Stoke City) left footed shot from the right side of the box is blocked. Assisted by Charlie Adam. Substitution, Stoke City. Josh Tymon replaces Erik Pieters because of an injury. Attempt blocked. Ryan Shawcross (Stoke City) header from the centre of the box is blocked. Assisted by Xherdan Shaqiri with a cross. Substitution, Stoke City. Saido Berahino replaces Mame Biram Diouf. Substitution, Stoke City. Charlie Adam replaces Darren Fletcher. Corner, Stoke City. Conceded by James Collins. Arthur Masuaku (West Ham United) is shown the yellow card. Corner, West Ham United. Conceded by Kevin Wimmer. Attempt blocked. Marko Arnautovic (West Ham United) right footed shot from the left side of the box is blocked. Assisted by Arthur Masuaku. Attempt blocked. Xherdan Shaqiri (Stoke City) left footed shot from outside the box is blocked. Assisted by Geoff Cameron.